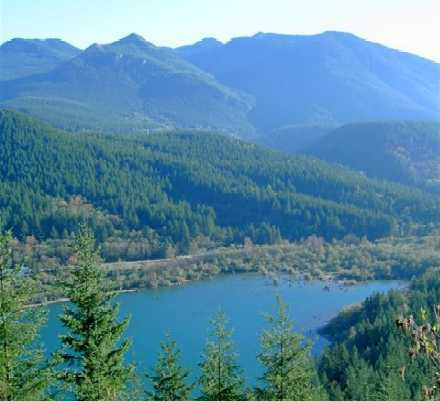 Rattlesnake Lake and the Rattlesnake Ridge trailhead is located just southeast of North Bend and about forty-five minutes to an hour east of downtown Seattle. This is a fairly moderate hike with just a few switchbacks and some beautiful viewpoints along the way. The distance is two miles each way with an elevation gain of 1,175 feet. It takes about two hours to complete. This is a “Hikers Only” trail, so you’ll need to leave your bicycles and horses at home. Take I-90 east and get off on Exit 32 (436th Avenue SE) just past the exits to North Bend. Take a right off of the exit, heading south on 436th Ave SE which turns into Cedar Falls Road. Travel about three miles and follow the signs posted for Rattlesnake Lake.